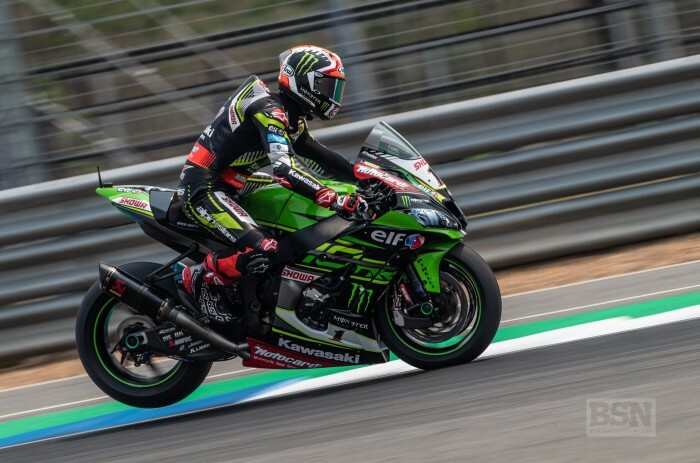 Outgunned down the massive straight, and on even the smaller ones at Chang, Kawasaki’s Jonathan Rea dug in to the task at hand like the world champion he is, to the point of even making accidental contact with eventual race winner and his early season bête noir, Alvaro Bautista. Rea admitted he rode to his and his machine’s full ability for most of the race, but in the end Bautista caught and passed him and then set a pace Rea at first could not match - and finally did not try to match. Rea heaped praise on his bike and its set-up, despite another runner-up finish. He went at lap record breaking pace until Bautista beat it, but it was all to no avail. “When I rolled off that little bit I lost the slipstream and when I do not have the slipstream here we are gifting Ducati too much time,” said Rea of his final lap decisions. “There was no reason to keep pushing. “If you watched the race you understand the story of the race and I am proud of my effort. I enjoyed it, and felt like I love riding at that level but unfortunately the result did not reflect that effort. Right now Ducati just have too much of an advantage. But I am really happy to pick up the rest and I felt great with my bike. In specifics, Rea explained what the current Ducati advantage is, not just on the long straights, but exiting onto all the straights. “Power,” said Rea. “It is very easy to see the two long straights, but in between every corner there is a straight where you can use power and this is where they have too much of an advantage, not a small advantage. “I do not want to complain, because it sounds like I am complaining and you guys are writing like I am spitting my dummy out. I am really happy with my effort, my team, the bike and things. But it is clear to see right now on the straight that we have a disadvantage. That is how it is right now. Ducati has done a great job with their bike and Alvaro is obviously riding very good as well. We cannot just magically find 25bhp to compete. It is how it is right now. I can fight with him in the corners; I can’t fight with him in the straight.